You are here: Home 2015 September Choose Cisco ACI or VMware NSX? 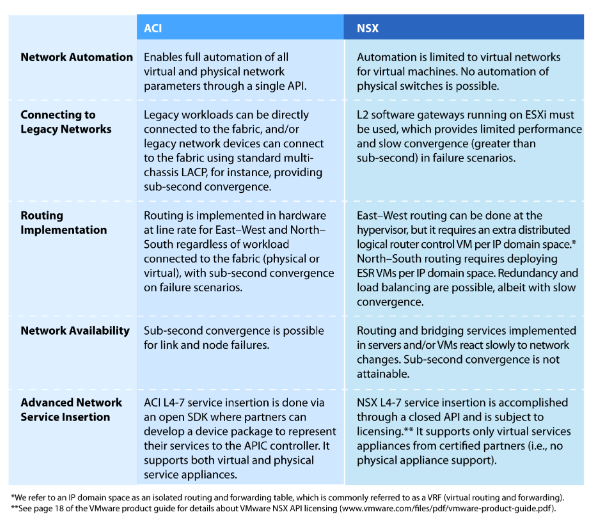 Choose Cisco ACI or VMware NSX? 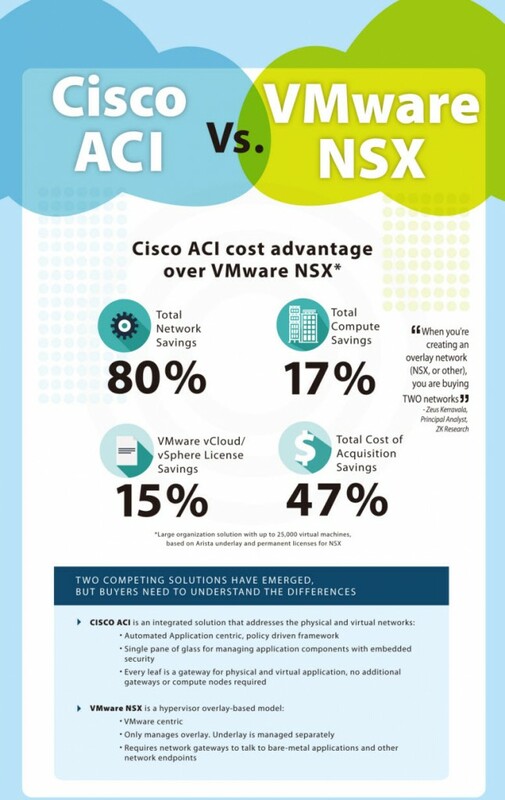 Cisco ACI or VMware NSX, which is your choice? Which one is the leader? It’s not easy to say who the leader is. But we can list the main differences between them and compare them in the real network environment, which can let you know them a lot. In fact, ACI and NSX provide very different approaches to solving networking challenges–the Cisco ACI is a programmable Ethernet Fabric that integrates hardware and software, while VMware NSX is a network overlay. Choosing between ACI and NSX is a strategic network decision, and is way beyond just a networking thing. The choice should include significant input from more than just than the network team. The scope of the operational changes that will result from deploying either Cisco ACI or VMware NSX will justify a longer time horizon than the usual data center network upgrade. And of course, there is always the option to run them together, which is also a topic of increasing interest from clients: Because VMware NSX can run over any hardware, it is technically feasible to combine it with Cisco ACI. However, deploying both solutions together will be prohibitively expensive for most enterprises. As long as the NSX and APIC controllers do not communicate, enterprises will run duplicate functionality such as security policies and will run nested VXLAN tunnels, further complicating the architecture. Enterprises are evaluating both Cisco ACI and VMware NSX to increase their data center network agility and fortify their security postures. These solutions offer different approaches for solving a similar set of challenges. On the other, ACI melds both hardware and software into a policy-driven network infrastructure built around the needs of specific applications. Both approaches will impact IT operations. Are these solutions and SDN in general worth exploring? Yes. NSX and ACI are evidence that software defined networking is real, providing a technological foundation that will allow speedy, reliable application delivery for organizations.